Single site located at a junction. Possibly the windiest service area known to man, Severn View is a historic and now slightly neglected site alongside the original Severn Bridge. Despite its name, it is not actually immediately adjacent to the bridge, the river or the motorway junction, though it is connected to all three by public footpaths. First two hours free for all vehicles, after which cars must pay £15 and HGVs, caravans and motorhomes £21. HGVs can pay £22.50 to include a £10 food voucher. Prices are paid using PayByPhone - more details. The location code is 2460. The fees are strictly enforced by CP Plus. The original services building, in 1966. The services has changed a lot since it opened, when it was known as 'Aust'. 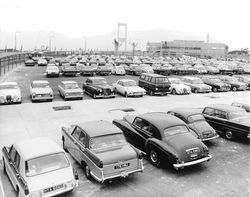 Back then it could be found off M4 J21. Its history has all the details. For all its flaws, the services are still probably the best place to park for accessing the Severn Bridge, but remember the two-hour free parking limit. 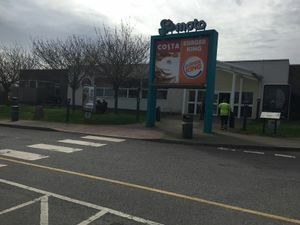 The current amenity building is probably the smallest at any signed motorway service area, but the large grounds make up for this. This public feedback has been left by other readers. When leaving your own, ignore any messages about 'object invalid value' - your message will still go through. Views expressed in these comments are those of the individual contributor. They are moderated by Facebook. We ask the companies named to check here regularly but can't guarentee they will do so.